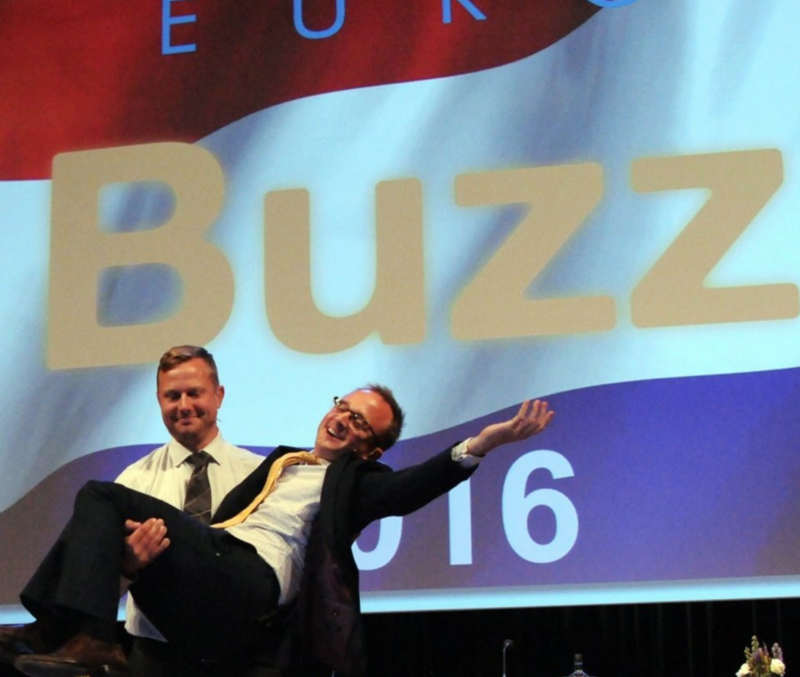 EuroBuzz 2016: The Euro-HD Network Meeting in The Hague - HDBuzz - Huntington’s disease research news. Here’s our roundup of all the science presented at the 2016 European Huntington’s Disease Network biennial meeting - one of the biggest meetings of Huntingtons Disease families, scientists and care professionals. 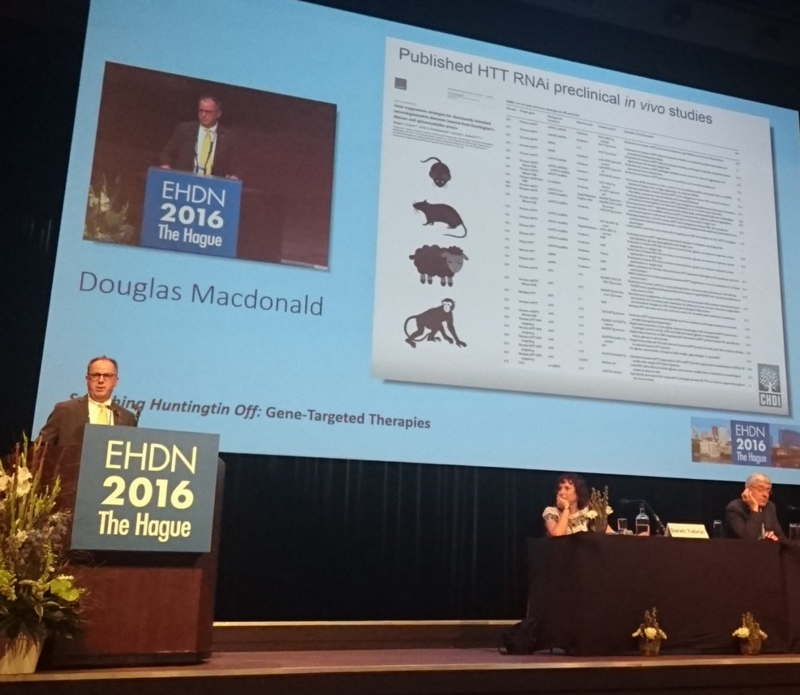 Dr Doug Macdonald pointed out the large number of huntingtin-lowering studies done in HD model animals. Now we are testing these drugs in real patients! Laura Ranum begins the session with a new take on how the HD gene may cause harm. Ranum: We tend to focus on the big bad mutant huntingtin protein but some genes can be read in different ways, like backwards. Those wonky genetic reads can let cells make small weird proteins that could be contributing to damage. Ranum has shown that some of these small weird proteins are present in HD patient brains, but not that they are responsible for harm Ranum: existing “gene silencing” drugs should target most of the message molecules that give rise to these weird proteins. Darren Monckton from Glasgow has been looking at why some people get HD earlier or later than expected. The length of the HD mutation is the main decider of when HD occurs. The longer the expansion, the earlier the onset, on average. By length, we mean the number of times the sequence CAG is repeated within the HD gene. But sometimes there are other spelling mistakes like CAG-CAG-CAA-CAG. Those little mistakes hidden within the CAG stretch are difficult to find, but new technologies let us read them. Monckton is using new sequencing technologies to read the precise code of the HD mutation in many hundreds of HD patients Early results suggest these little hidden mistakes may contribute to cells getting sick, & even when HD occurs. But early days. Next Flaviano Giorgini from University of Leicester is talking about mitochondria, the little blobs that power our cells. Flav just said “the matrix” but he’s not talking about a dystopian future where computers rule over vast colonies of human slaves. In living cells, mitochondria are constantly dividing and merging, like beads of water merging into a puddle. In HD, mitochondria have a tendency tendency to fragment, remaining as separate beads of water, rather than puddling together. Interestingly, dysfunctional mitochondria are emerging as a driving force behind the development of Parkinson’s Disease. Flav is using fruit flies to study potential connections between Huntington’s and Parkinson’s disease mitochondrial problems. When Flav makes HD flies express extra copies of a Parkinson’s Disease mitochondrial gene called “Parkin” they live longer. This supports the idea that specific kinds of mitochondrial problems in Parkinson’s and Huntington’s Disease cells may be similar. Robert Pacifici is the chief scientific officer of the CHDI Foundation, which is dedicated solely to developing HD therapies. Pacifici describes the foundations efforts to develop therapies for the kinds of energy deficits already discussed today. Pacifici reminds the conference that low energy levels have been observed in HD patient brains very early in the disease. And that the two largest HD human trials ever yet run, testing Creatine and Co-Enzyme Q10, aimed to bolster energy levels. Unfortunately, both trials failed to improve HD symptoms. Pacifici believes this doesn’t mean that bolstering energy in HD is a bad idea, just that we might not understand it well enough. CHDI is working with a range of energy experts to try and dissect precisely how energy deficits in HD cells happen. Pacifici - If we better understand the origin of the energy deficit in HD cells we can design better ways to fix it. 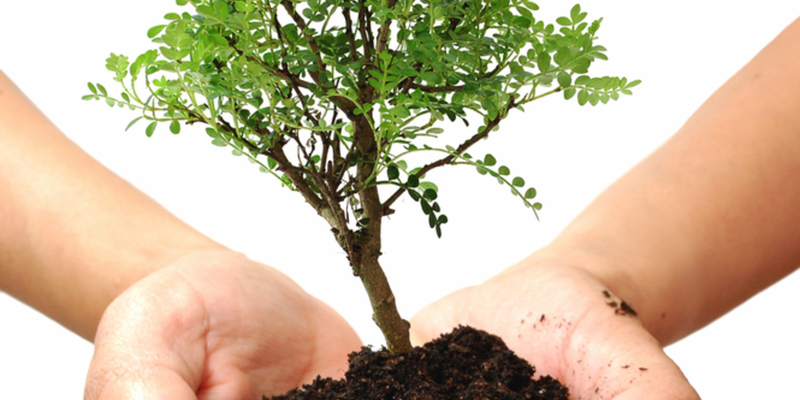 As cells age they undergo a process called ‘oxidative damage’ when critical cellular components are chemically damaged. Pacifici describes links between oxidative damage and the reduced ability of cells to make enough energy to survive. CHDI is developing standardized tools for researchers to quantify oxidative damage, a really tricky thing to do in the lab. Researchers working with CHDI use super powerful MRI machines to measure chemicals in the brains of living HD patients. This will allow future drug trials to include real-time measurements of energy production in the brains of HD patients. These measurements in living human brains are a “really cool” advance on using mice or tissue samples from deceased HD patients. The next session focuses on the really exciting topic of Huntingtin lowering strategies, sometimes called ‘gene silencing’. The gene targeting therapy session kicks off with an introduction from Prof Sarah Tabrizi, of University College London. She reminds the audience the basics of HD biology: a mutant gene is read by cells, and the information copied into a ‘message’. This ‘message’ copy of the gene is ultimately used by cells to build a mutant huntigntin protein, which we think causes HD. So, we have a couple targets for interfering - a mutant gene, a mutant gene ‘message’ and the protein itself. Doug Macdonald, CHDI foundation, addresses the conference on the first of these targets - the ‘message’ linking gene to protein. There are a range of technologies that can do this, each with benefits and disadvantages - the HD field is trying them all! All these techniques work by targeting the message linking the HD gene to protein for destruction. Some of these approaches require a harmless virus to deliver the drug leading to HD gene message destruction. Generally, using viruses to carry instructions for cells in this way is called “gene therapy”. Other ways of targeting the HD message molecule, like a kind of drug called “antisense oligonucleotides”, don’t require viruses. 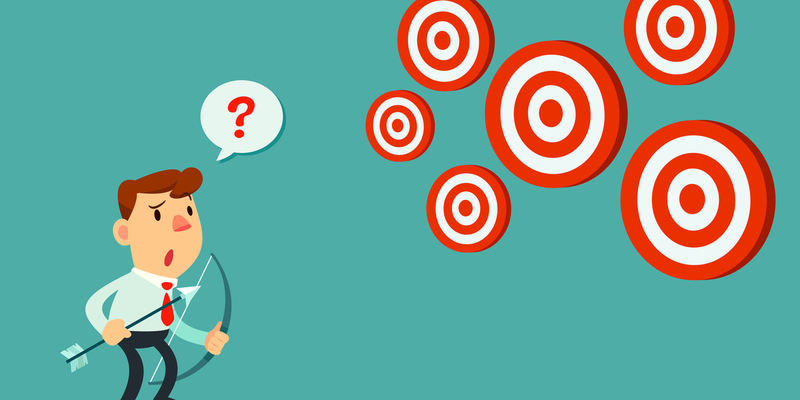 The latter approach has been pioneered by Ionis Pharmaceuticals, who are currently running an exciting trial in HD patients But a range of companies are now pressing forward with both ASO and viral approaches to achieve HD message lowering in HD patients. Macdonald reminds the audience that viral treatments only need to be delivered once, while ASOs need to be re-administered. This could be good or bad, it’d nice to only have one injection, but also nice to be able to stop delivering drugs if necessary. These complexities can only be worked out in human clinical trials, like the one Ionis is conducting now. Participants in these trials are research heroes, taking on the risk of testing these drugs for the whole HD community! Macdonald updates the audience on the progress in developing “biomarkers” for HD trials which reduce the HD message and protein Biomarkers are things we measure in people after treatment with a drug. One type tells us if our drug does what its supposed to. Macdonald works with a large team of researchers. who have developed really sensitive tests for levels of the huntingtin protein. So, given that our goal is to reduce levels of HD protein, researchers can use these tools to establish whether their drugs work. Dr Paul de Sousa asks Prof Tabrizi - “what’s next, and what’s the timeline for the on-going Ionis trial?” Prof Tabrizi reminds the audience that the current Ionis trial is a safety study, designed to establish the drug is safe in humans. Normally, this safety study would be followed by two additional studies to see if the drug actually works But, in this case, plans are underway that may collapse these studies in what’s called a straight to pivotal approach! If possible, the next study would be a single trial designed to establish if the drugs are effective in HD. This is proof that everyone involved wants to get these drugs to HD patients as quickly as possible, if they’re proven safe and effective. Next, advice from a researcher who has already worked on a human brain study of ASOs. Prof Francesco Muntoni, Univ College London. Muntoni has worked extensively in neuromuscular diseases such as Duchenne Muscular Dystrophy and Spinal Muscular Atrophy. In both these diseases, Muntoni uses ASOs to modulate messages for specific genes, similar to what we’d like to do in HD. Francesco Muntoni is a bit of a legend in developing treatments for degenerative diseases in kids. Muntoni studies children with Spinal Muscular Atrophy, he describes it as “genetic polio” because SMA kids lose muscle control. An ASO drug called Nusinersen helps animal models of SMA after being delivered to the fluid which bathes the brain and spinal cord. It is now being tested in infants with SMA, who receive spinal fluid injections of the drug. Similar delivery is being used for the ASO drug currently being tested in adults with HD, so we can learn a lot from SMA. Muntoni describes really exciting results from SMA trials that show kids treated with Nusinersen do much better than expected. Muntoni shares video of a child treated with Nusinersen who has a really amazing amount of motor control for a kid with SMA! This is exciting stuff for SMA. The final talk of the session is from Matt Chiocco, Shire Pharmaceuticals - they have a different approach to lowering huntingtin. Rather than trying to destroy the message, Shire has an approach that stops the message from ever getting made in the first place. Chiocco describes Shire’s expanding gene therapy programs. Remember, these are single-delivery approaches relying on viruses. Shire and Sangamo have developed really cool tools called “Zinc Finger Protein Repressors”. It’s a mouthful, but basically they’ve designed custom proteins that stick to the DNA near the HD gene. When delivered to cells, the proteins physically block the machinery required to copy the gene into its message. No message, no protein. Shire’s approach is to create viruses which teach cells how to stop the HD gene from being copied into its message. When they deliver these viruses to the brains of HD mice, they see improved symptoms, suggesting they’re on the right track! The afternoon’s session starts with a discussion of ‘large models’ of HD. Most lab work in HD is done using small animals like flies, worms and mice, which are relatively easy to work with. But David Howland, of the CHDI Foundation, reminds the audience that “only humans suffer from Huntington’s Disease”. Howland reminds us that a mouse brain is 1/1,000th the size of a human brain, and lacks the convolutions of the human brain. If researchers are trying to deliver drugs to the brain, for example, it’s much easier to fill up a mouse brain than a human one. Howland suggests animals like monkeys or sheep are useful tools for developing HD drugs because they have big, complex, brains. Researchers have already developed lines of sheep, pigs and monkeys with the HD mutation to enable testing drugs in larger brains. Prof Jenny Morton, Cambridge University, has pioneered the use of sheep as important models for HD research, Morton provides examples of technologies, such as MRI for imaging living brains, that works in both sheep and HD patients. Her team has now done a huge range of experiments, including examining the thinking ability of HD sheep. Morton has an interest in the thinking problems that accompany HD - these are hard to study in mice, who are pretty dumb! Morton experimented with new ways of testing complex mental operations, like recognizing faces Sheep can rapidly learn to recognize a face, like that of actress Emma Watson, with great accuracy - even with different hairstyles! It takes sophisticated brain machinery to recognize images of a specific human face and differentiate it from other faces. These kinds of mental gymnastics prove why HD sheep models could be useful for testing drugs targeting thinking difficulties in HD. Why is Ralf Reilmann raising pigs that carry a HD mutation? Pigs have big brains that are somewhat similar to human brains Ralf’s pigs will help us plan and design trials of HD drugs aiming to treat the big brains of humans. And Anthony Chan helped develop the first ever monkey model of Huntington’s Disease. Quick summary of the ‘Short Communications’ session which we were unable to live-tweet: Pamela Farshim from UCL told us that newly-engineered viruses can spread much better through the brain of HD mice. Better viruses could help us get ‘gene therapy’ or ‘gene editing’ treatments to more areas of the HD brain. Rana Soylu from Lund University used viruses to make individual brain areas produce the mutant huntingtin protein in mice. The brain’s hormone control centre, the hypothalamus, made other brain areas go wrong when it produced mutant huntingtin. Gillian Bates & Nadira Ali from UCL have identified a message molecule that is produced when reading of the HD gene goes wrong. That message could lead to a harmful ‘short’ version of the huntingtin protein. They found the short message molecule in HD brains. They’re now working on figuring out why this message molecule forms in HD and whether its protein causes damage. Emma Yhnell presented data showing that training HD mice in advance improved their performance later on thinking tasks If ‘brain training’ has long-term benefits in HD, it would be great to use it in humans. Emma is planning a study in patients And Dr Ed Wild announced the HDClarity Study, the biggest ever cerebrospinal fluid project in HD. Wild: “HDClarity is now open for business” - researchers can ask to use the samples and data by visiting hdclarity.net. Lori Quinn, Columbia University, describes a study of physical activity she is involved with called “Engage-HD”. The study aims to establish whether actively supporting and coaching physical activity in HD could be beneficial. She presents data suggesting that they were able increase patients physical activity during the short term trial. Excitingly, HD patients with increased activity also showed slightly improved mental flexibility. This well-controlled small study suggests keeping HD patients active is good, and may have unexpectedly broad benefits. As they wrap up this initial study, Quinn is excited to plan for larger trials that could provide more detailed guidelines. Beth Fisher, from USC, is also interested in the impact of exercise on brain health, specifically in Parkinson’s Disease. Like Huntington’s, Parkinson’s disease results from the slow loss of specific brain cells over a long period of time. To Fisher, this is remarkable, because it suggests the brain can compensate for ongoing injury for a long time without symptoms! Her group studies both human Parkinson’s Disease patients, as well as mouse models of the disease. They’re interested in the impact of exercise on mice and human PD patients who already have symptoms. Both mice and people were exposed to high- or low-intensity exercises, like running and walking, respectively. Using a fancy imaging technique called “PET scanning” Fisher’s team can look for changes in brain function in intact brains. In PD mice and people, high intensity exercise improves the function of brain circuits controlling movement. Fisher believes that the important aspects of an exercise program are learning a new skill and aerobic intensity. The success of studies of exercise in Parkinson’s Disease provide additional support for our studying these benefits in HD. Marina Papoutsi, UCL, is interested in ways that HD patients could train their brain to be more ‘plastic’ or flexible. Her study, HD-Brain-Train, uses something called “neurofeedback training” as a sort of brain exercise for HD patients. Subjects, in a scanner, are able to see a graphical representation of activity levels in specific parts of their brain When imagining activities, say running, activity in this brain region increases, just as it would if they were actually moving. Patients are able to get immediate feedback on how much brain activity is happening. This feedback allowed participants to increase their brain activity over 4 weeks of training. This increased brain activity was associated with better performance on some movement tasks that deteriorate in HD patients. Papoutsi’s studies suggest that brain exercise can also be helpful for at least some HD patients, and bigger studies are ongoing. Prof Anne Rosser of Cardiff University studies whether replacing lost brain cells is a feasible approach to treating HD. Previous ‘cell replacement’ studies have shown mixed results but give a glimpse that the right cells in the right place can work. Cell replacement isn’t currently reliable. The injected cells can die an the responses are highly variable. How can we improve? Rosser has formed the Repair-HD consortium to look at other sources of cells to try to fix the problem. The science has moved on a lot - we can now make brain cells from skin tissue - these are known as induced pluripotent stem cells. We have better recipes for making brain cells and a better idea how to make them happy and ready for injection into the brain. This session is on oxidative stress in HD - how the body handles reactive chemicals. Staying alive is hard! Our cells are constantly producing chemicals that can be harmful if they stick around. The most reactive chemicals can cause damage by oxidising other stuff - similar to what happens if you burn something. Sounds bad. Unsurprisingly our bodies have chemical defence mechanisms to protect against this oxidative damage. NRF2 is a protein that acts like a master-switch to control the response to oxidative stress. It’s been reported that oxidative stress response goes wrong in HD. Remember coenzyme Q? That was an antioxidant we tested in HD Coenzyme Q didn’t work but maybe we can develop new drugs that are better. Better at getting to the brain, better at fixing things. Alberto Bresciani is working with CHDI Foundation to develop drugs that bind to NRF2. Alberto’s videos of the drug target are very sciencey and impressive! 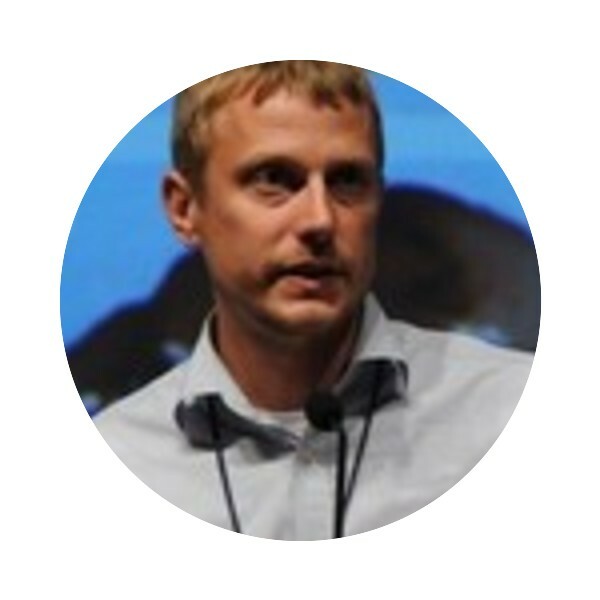 Jeff Johnson uses genetically engineered mice & viruses to study where oxidative damage is important in HD. Brian Wipke from Biogen offers lessons from multiple sclerosis and the drug DMF. DMF works well in MS and one of its actions is antioxidant, activating the Nrf2 pathway. Might it be useful in HD? Alice Rivieres asks, what is the role of art in living with something very real like Huntington’s Disease? Her organization, Ding Ding Dong, explores the HD experience through art. Rivieres tells us we should listen to, and believe, HD patients when they tell us how they feel. Rivieres ends her talk with thanks to her ‘little brothers and sisters’ - all the HD mice in the world! Anne Lennon-Bird bravely describes to the conference her families experience with HD, and her struggles as a mother and wife. She and her husband took a very open approach to communicating with their children about their father’s HD diagnosis. She movingly describes the paradox of caring for a person who is irritable or explosive, but still desperately needs your help. And the fundamental unfairness of children being forced to become caregivers for their parents suffering from HD. She empowered her kids by involving them in decisions about their dad’s care. Lennon-Bird on the horror of thinking of ones children inhering HD - “you cannot protect your child, you cannot keep them safe”. Lennon-Bird reflects that, while HD is a horrible tragedy for her family, it “has made us who we are, and what we are”. Finally Dr Martha Nance shares her experience as a physician focused on HD in Minnesota. Nance’s advice for physicians working in Huntington’s Disease - “say yes” to opportunities to be involved with the community. And that, “the greatest gift you can give as a physician is the gift of your time”. Finally, Nance tells us: “you need a team, you can’t do Huntington’s Disease by yourself”. Now for more science! The second “short communications” session showcasing the most exciting new developments. Davina Hensman-Moss of UCL is presenting her work on DNA repair pathways in HD. Davina assembled a huge number of DNA samples from HD and some rare, genetically similar diseases. They looked for genetic differences that might affect cells' ability to repair their own DNA. One theory is that if cells can’t repair their DNA, the HD genetic error might grow in some cells, accelerating the disease. They found that genetic differences in DNA repair machinery ARE linked to earlier onset across these ‘genetic expansion’ diseases. Excitingly, these findings could eventually lead to treatments that work for several diseases. Ahmad Aziz, University of Leiden, wondered if the number of CAGs in the HD gene affects the brain even in the general population. He found some evidence for an effect but it’s complicated as depression is very common and multifactorial. Izelle Labuschagne studies oxytocin, a hormone with a complex relationship to biology and behaviour. Oxytocin may be lowered in HD so Izelle did an MRI experiment looking at the effects of oxytocin nasal sprays. Patients given oxytocin had more brain activation when attempting to recognize emotions. Duncan McLauchlan of Cardiff University studies apathy in HD - loss of energy & motivation. McLauchlan developed a series of computer games to measure apathy and motivation. McLauchlan found differences in performance that could help explain the brain functions that contribute to apathy. Clare Eddy of University of Birmingham uses electrical stimulation to study the brain in HD. Stimulating the brain helps us study things like differences in memory functions. Eddy found that electrical stimulation briefly improved some aspects of functioning in some patients. We’re not ready to start electro-hacking HD brains yet, but worth looking at whether it increases efficiency of other treatments. Claudia Testa presents data from the First-HD trial of a modified form of tetrabenazine. SD809 was beneficial for reducing unwanted movements and made people feel better. The ARC-HD trial looked at what happened when people switched from tetrabenazine to SD809. The top line results of ARC-HD showed chorea control was about the same after switching to SD809. Dominique Bonneau presents a trial of cysteamine in HD. Cysteamine has shown benefits in HD animal models but we don’t really know how it works. The human cysteamine trial was 18 months ‘blinded’ followed by an 18-month open-label extension. Cysteamine failed to meet its primary endpoint - it didn’t work. The cysteamine trial was big, but possibly not big enough. Unclear whether there is enthusiasm for an even bigger, longer trial. Harald Gelderblom presents the Action-HD trial of buproprion to treat apathy in HD. Buproprion is a drug used to help people quit smoking - the link with improved motivation inspires the idea it might help apathy. We really need good treatments for apathy in HD because it’s a significant problem that’s very difficult to treat. Unfortunately there was no benefit from buproprion on apathy - a negative trial. Monica Busse Cardiff University presents the Exert-HD trial of structured exercise in HD. 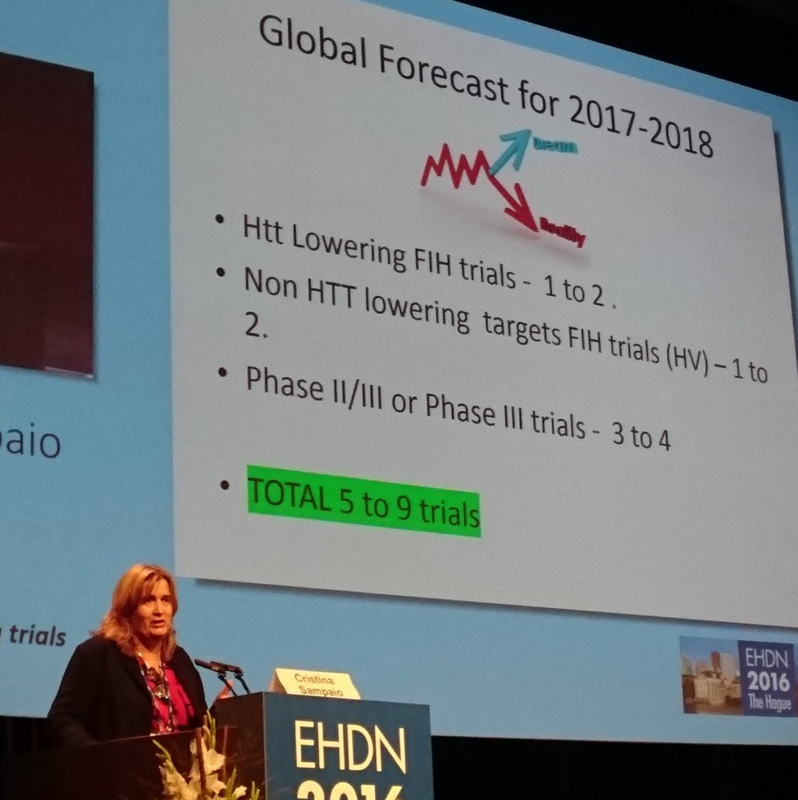 Exert-HD was a POSITIVE trial. 3 months of supervised exercise led to improved fitness and movement function! No benefit of exercise on thinking (cognition) was seen. Patients who did exercise lost weight - that could be good or bad, depending on your starting weight. Michael Hayden of Teva Pharmaceuticals presents recently completed Pride-HD trial of pridopidine for movement in HD (read the pridopidine backstory here). While Pride-HD has been happening, Teva has discovered that the drug may have several different effects on different brain systems. Headline result of Pride-HD trial: pridopidine did NOT improve motor function compared with placebo. Teva’s looking into whether there is an effect on disease progression despite the lack of motor benefit. It is not clear that there is. More on this soon from HDBuzz! Bernhard Landwehrmeyer recaps all the current trials still underway. There are lots! Christina Sampaio teases upcoming clinical trials - HD paves way for innovative trial designs, eg ‘first-in-man’ trials in patients not healthy volunteers. Sampaio: “We should be good at killing”!!!! (She means killing bad ideas or failed drugs!) Sampaio - Wave Life Sciences seems most committed newcomer to huntingtin-lowering. Sampaio: we will likely see 1-2 trials of brand new HD drugs in the next couple of years. We’re going to be busy! Join Enroll-HD now to be ready for these future trials! And Ralf Reilmann’s machines for measuring movement are now being used in several clinical trials. differentiate differentiation is the process of one cell type turning into another cell type.